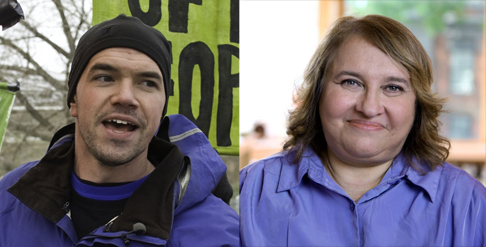 November 11th the Rubin presents a conversation between activist Tim DeChristopher and meditation teacher Sharon Salzberg on how far we need to break the rules in order to reverse climate change. Details and tickets on the Rubin website. Tim DeChristopher committed an act of nonviolent civil disobedience in 2008 when he disrupted a government oil and gas lease auction of 116 parcels of public land in Utah’s Red Rock country by successfully bidding on 14 parcels of land for $1.8 million with no intention to pay for them. DeChristopher was removed from the auction by federal agents and taken into custody. After being imprisoned for 21 months, he was released in April 2013 and co-founded the nonprofit Peaceful Uprising. He is currently on a three-year probation. The recently released documentary film, Bidder 70, tells DeChristopher’s courageous story. He began studying at Harvard Divinity School in 2013. Sharon Salzberg is co-founder of the Insight Meditation Society (IMS) in Barre, Massachusetts. She has been a student of meditation since 1971, guiding meditation retreats worldwide since 1974. Salzberg’s latest book is Real Happiness at Work: Meditations for Accomplishment, Achievement, and Peace. She is a weekly columnist for On Being, a regular contributor to The Huffington Post, and the author of several other books, including the New York Times bestseller Real Happiness: The Power of Meditation: A 28-Day Program (2010), Love Your Enemies (2013), Faith: Trusting Your Own Deepest Experience (2002), and Lovingkindness: The Revolutionary Art of Happiness (1995). Salzberg has been a regular participant in the Rubin Museum’s many on-stage conversations and is currently leading midday meditation sessions on select Wednesdays at the Museum.